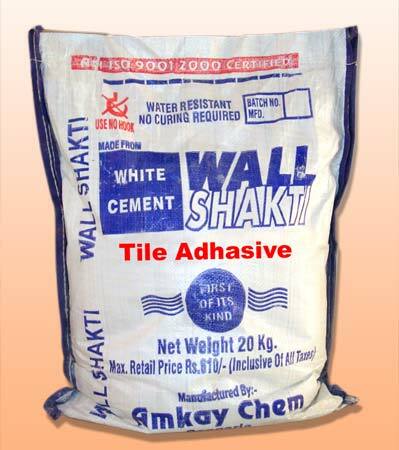 We are recognized as one of the most preeminent Tile Adhesive manufacturers in India. The tile adhesive is mainly comprised of cement that makes it suitable for the fixing of tiles on the external floor and internal walls. These are also well suited for fixing most of the natural stones. The ceramic tile adhesive is available in HDPE packets that contain 20 kg of tile adhesive. These exhibit excellent durability and resistivity to various extreme conditions. The floor tile adhesive should be used within 30 minutes after being mixed with water so as for better result. Moreover these are available at very affordable prices. Excellent performance and slump resistance. Suitable for ceramic tiles and most natural stones. Flexible, cement based adhesive - just add water. Can be used over most building board surfaces. Ideal for same day grouting. Mix Powder to water in the proportion of approx 3:1 By volume. Mix it thoroughly to uniform consistency. After allowing the mixture to stand for 5to 10 min, stir mixture again just before spreading. Apply the mixture on the surface smoothly using the notched trowel maintaining a thickness of 3 mm. Ensure the total usage of the mix within 25-30 min.